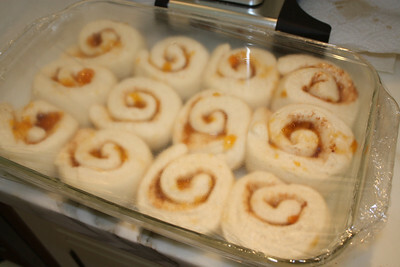 That's all it took to send my tail spinning down the path of the dark side to these mouth watering peach sweet rolls. 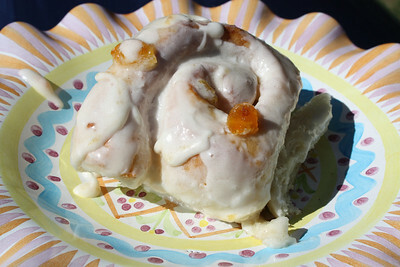 My amazingly gifted friend, Dustin Hansen, innocently posted on Facebook, "What if cinnamon rolls and peach cobbler had a baby? " And that did it. That got me searching the Internet for recipes and rummaging through my pantry for ingredients. 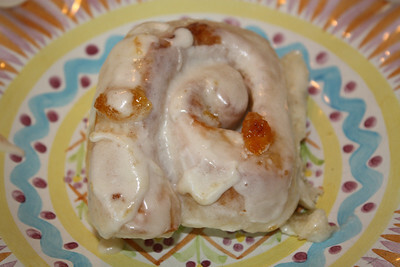 The result--quite possibly my favorite breakfast treat of all time. 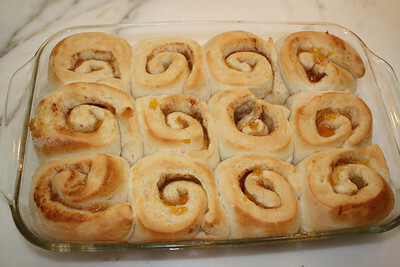 I made 12 of these delicious peach rolls. TWELVE. And my family of 4 (two under the age of 8) inhaled them all. It was a peachy feeding frenzy. Seriously, once these rolls touch your lips--it's over. So consider yourself warned. The core ingredient of this recipe is good peach jam. I make my own, and honestly, it's not difficult. 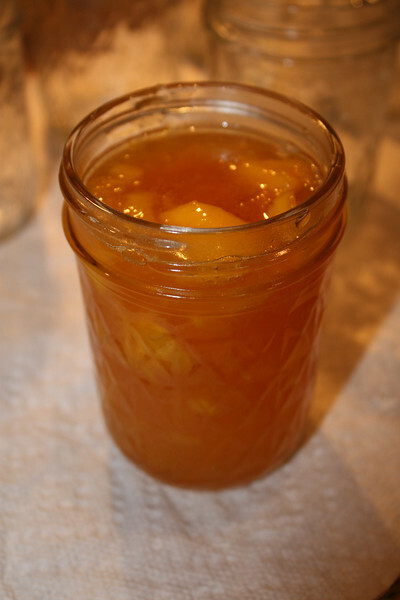 So if you have access to fresh peaches, click on this link for my easy Peach Jam Tutorial. If fresh peaches are not within your grasp, or you're shaking your head sayin', There's no way I'm making my own jam, Erin, then try your best to get your hands on some good peach jam at a farmer's market. I did find Pearson Farm online sells their own peach jam. I haven't ordered from them, but it looks yummy! I'm sure if you look around, you can find jam somewhere. Allow one loaf of frozen Rhodes bread dough, white or whole wheat, to thaw in the refrigerator over night. Butter a 9"x13" glass baking dish. 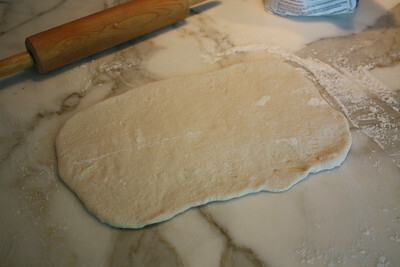 Roll out your thawed dough to around a 9"x13" rectangle. 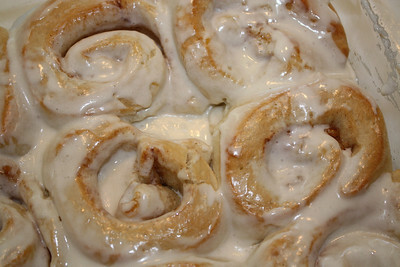 Rub rolled out dough with 1 tablespoon melted butter. 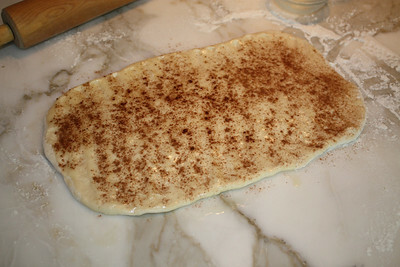 Sprinkle 1/2 teaspoon cinnamon over the butter. 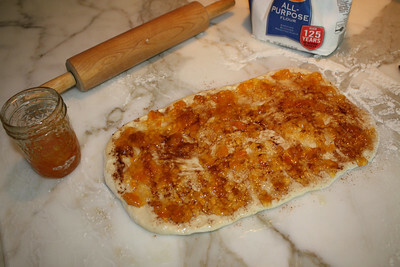 Spread a generous 1/2 cup good peach jam on your dough, over the cinnamon and butter. 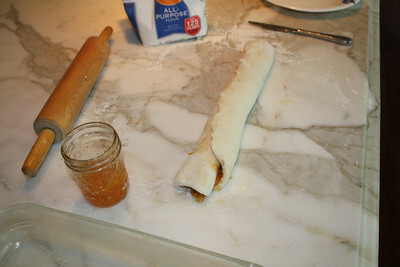 Roll everything up into a long tube-like jelly roll. Slice your roll into 12 equal coins. Place coins sliced side up into your buttered 9"x13" baking dish. 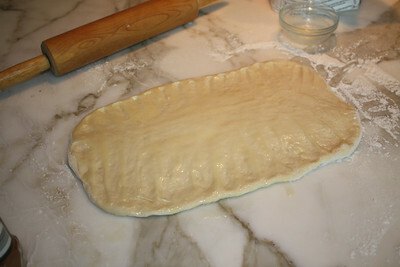 Cover with plastic wrap and allow dough to rise in a warm place until rolls are double in size. 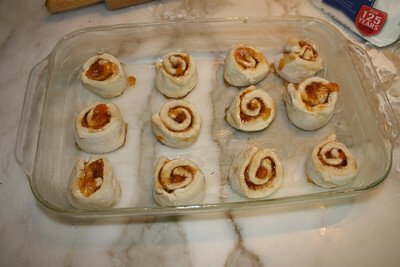 Preheat oven to 350 degrees and bake for 15-18 min or until tops of rolls are golden. 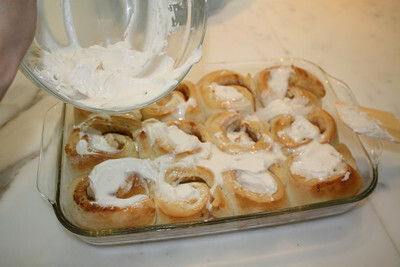 Remove rolls from oven and immediately spread peach icing (recipe to follow) over the top. Whip butter, cream, vanilla and peach jam until combined, then whip in powdered sugar. WOOHOO! I'm so making these. They look easy and delicious! Thanks, Erin - you's the bestest! 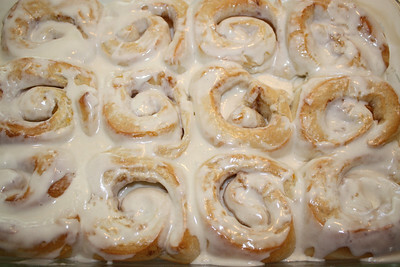 Mmmmm these rolls look heavenly!!!! 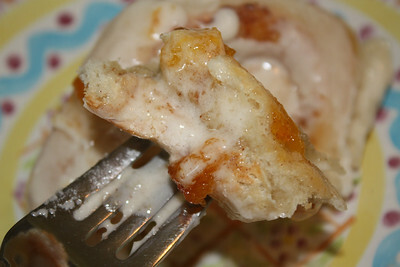 I only ever make cinnamon rolls, but this looks like such a great alternative! 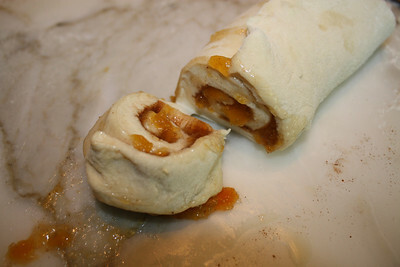 I love peaches, and can't wait to make this! Thanks for sharing! 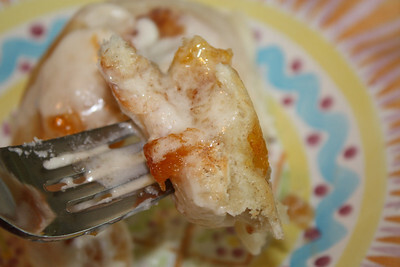 My mouth literally started watering when I read peach jam icing...Mmm...They sound sinfully delicious, Erin!